Do you want to get started bike camping but aren’t quite sure where to begin? With Southern Campout happening next month, we want to share some of our top tips for first time bike campers, to help you get geared up and ready to roll on your first adventure! A few years ago I got hooked on bike camping when I joined some seasoned cycle touring friends for an overnight microadventure (also known as an S24o, in cycle touring lingo). At the time I had limited gear and a lightweight commuter bike that had never carried anything heavier than a bag of groceries! But I didn’t let that hold me back and once I had packed my bike and was on the road, I discovered how truly exhilarating and enriching travel by bike could be. It has enabled me to break with routine and reconnect with the simple pleasures in life – the warmth of a campfire, food and laughter shared under a glittering night sky – and to find freedom in adventure. The great thing about an overnight bike camping trip is that you don’t have to use a touring bike or need loads of touring gear. The best bike to use is the one you already have! That said; check that your bike can handle the terrain you’ll be exploring. If there are a lot of hills, pedaling will be easier if your bike has gears, especially if you are carrying extra weight. Good brakes and a comfy saddle are also key. Once the bike travel bug bites, you’ll probably want to buy a bike that’s built for touring or bikepacking. High quality, steel frame bikes make the best adventure bikes. They’re strong, light and durable, have lots of space for bags, eyelets for bike racks and are built to handle load. Alternatively a modern cross country hardtail, can be used with bike packing bags. Bikepacking bags (handle bar bag, frame bag and seatpost bags) are a great solution because they can easily fit most bikes and don’t rely on the frame having eyelets for racks and panniers. They also work well if you are planning to ride off road trails, as they are better balanced and stabilized for the rough sections. The traditional and most common set-up for cycle touring is to use a rear rack to carry your panniers full of food, camping supplies and your shelter. Depending on how much gear you need this can be paired with front rack and front panniers and a handlebar bag. This setup is perfect for gravel and tar roads. Some people combine bikepacking and touring gear to get the best of both e.g. running a bike packing handle bar bag in the front and a rack with small panniers on the back. Others run a seat bag or frame bag combined with a front rack and small front panniers. The options are endless. #TIP: MacGuyver it. If purchasing bike bags is out of your budget, a comfortable daypack (bike specific models that are 14+ liters in capacity are best) teamed with dry bags strapped to your handlebars and seatpost or rear rack makes for a cost effective, DIY solution. A front basket also makes for a good bikepacking alternative. Having a comfortable nights sleep is key to enjoying your adventure. You should bring along a mat, sleeping bag and shelter. Look for the lightest most compact equipment. Gear designed for hiking or backpacking is perfect for bicycle travel. You can find lightweight hiking tents (one man or two man) at most outdoor stores. Firm favourites are First Ascent’s Starlight II and the ultra lightweight MSR tents. Another great option for short trips is a bivvy bag or hammock and/or tarp. These are super light and take up so little space, plus you get to sleep under a ceiling of stars. #TIP: Beg, borrow…rent. If your budget is limited and/or you’re just trying out bike camping, we suggest making do with the gear you already have and borrowing or renting additional gear. If you only have a heavier 3 man tent, find some people to share with and break up the tent so that you each carry part of the load. The simplicity of bike travel is one of its great joys. Try to pack as minimally as possible and strip down to the daily essentials with self-sufficiency in mind. You don’t need to rough-it (unless that’s something you enjoy doing) and for short adventures it’s a good idea to bring along some little luxuries that bring you pleasure and comfort e.g. a coffee filter or hot water bottle for a cold night. If you are traveling with friends, split the gear between you – e.g. take one stove to share or use a 1L pot and cook in cycles. Click here for a full pack list of all the gear and essentials that you may need. Once packed make sure that the weight in your bags is even so your steering is stable. #TIP. Pack smart – decant salt, food, soap and sun screen in a smaller containers/ ziplocks. Fill up dead space by putting your fuel bottle, some food, and even a pair of socks into your cooking pot. Fix your tent on top of the rear rack with a bungee to create more space inside the bags for sleep set-up, clothes, and kitchen (this will also help keep them safe and dry if it is raining). For an overnight camping trip take lots of fresh food along, or stop at local shops along the way to buy supplies and drinks (your water bottle holder can double as a wine bottle carrier on short rides). If you’re not into cooking or running out of time throw some left overs into a spill proof container and take no-cook breakfast like yogurt and granola. #TIP: Cook up a storm. For some meal inspiration, check out the wonderful bike touring cook book – Bike. Camp. Cook. filled with delicious recipes and one-pot meal ideas. There is no wrong or right way to adventure. You choose the pace and distance. For your first bike camping trip it is a good idea to keep the distance low and terrain easy so that you can get used to riding a loaded bicycle. In South African you are spoilt for choice with an abundance of campsites and wild places right on your doorstep! If needed you can combine cycling with public transport (train, bus or ferry) to reduce the distance you need to cycle. Browse our collection of favorite adventures and bike friendly camping spots or just grab a map, drop a pin and go! Plan your route around quiet roads and gravel farm roads. Use Ridewithgps.com or Strava’s heat map, to find and create new routes. Sections of your route may well be in traffic and as always stay alert and ride responsibly and safely. If you are planning to ride during dusk, dawn or at night, use bike lights to make yourself visible. When camping or cycling in the wild follow these 7 Leave No Trace principles to keep your impact to the minimum and ensure SA’s wild places and trails remain unspoiled for years to come. #TIP: Be tech and mech savvy! For adventures far of the beaten track, always take a printed map along as well as your navigation devices (GPS/smart phone) as mobile connectivity is not always reliable or available. You should know how to fix a flat and have the tools to do basic roadside repairs. A puncture repair kit, extra tube, multi-tool, some extra bolts in case your racks come loose, and zip ties which are any McGuyver’s best friend! Above all, adventure is the spirit of trying something new, of challenging yourself and getting out of your comfort zone. You will have loads of fun on your bike and discover a freedom, connection and joy that only travel by bike brings. But don’t take my word on this – jump on your bike and take the path less pedaled. The best routes are the ones you haven’t ridden. You could pedal the same loops year after year. Many people do, literally or figuratively. But to grow, you need new rides. Risks. Turn down lanes you’ve long seen but never traveled. Get lost once or twice, then double back to where you started and try again. Live like this and you come to see unknown territory not as threatening, but as intriguing. 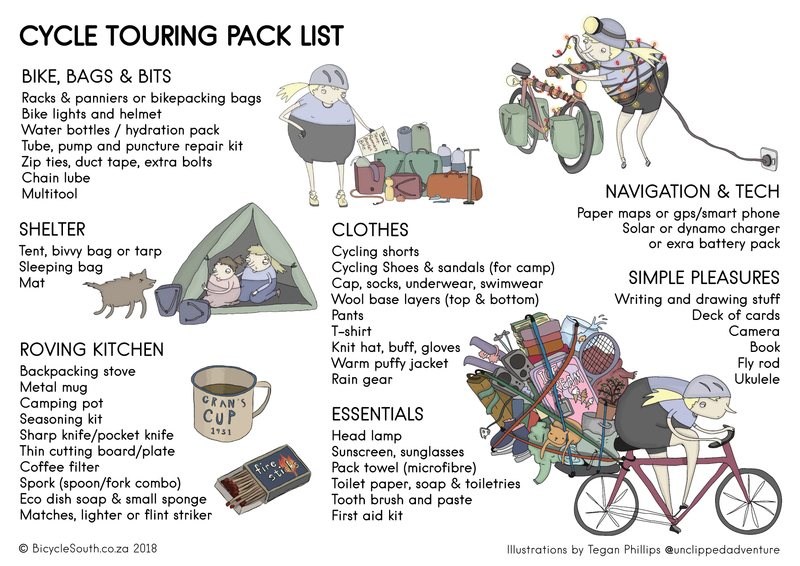 Illustrations by cycle adventurer and cartoonist Tegan Phillips @unclippedadventure.